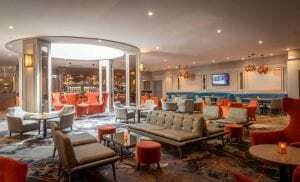 The newly opened Grandstand Bar at Clayton Hotel Ballsbridge has been transformed into a trendy and vibrant location with the addition of a new drinks menu, interiors and unique to the bar, the Gin Factory, which you can taste a wide variety of gins & tonics and an array of accoutrements. In addition, the bar also offers a full bar menu for get-togethers or evening bites. Feeling hungry? Try our Grandstand Burger which includes Gubben Cheese, Crispy Bacon – basically all of the good stuff we know you will love! The bar is perfect for pre-match, pre-concert or post-event evening.